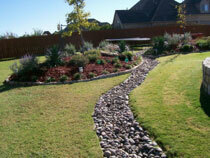 Many homeowners are looking for interesting ways to improve their landscape. One idea that will add depth and elegance to your front or back yard is to have a beautifully designed retaining wall built on your property. We are pros at Building Retaining Walls in Arlington, TX and have been in business for decades. You can trust our skilled and well trained technicians to properly build and install your wall. We offer high quality services that are unmatched and guarantee that our efficient technicians will do an outstanding job. Plus, our crew will help you design the perfect retaining wall for your landscape. You can rely on our technicians to build the wall exactly the way you want it to look. When the job is complete, you will have a durable and highly functional wall that will last a lifetime. You can be assured that your wall will be well built and will not split down the middle, bulge, crack or lean or fall over. Our first-rate technicians will not be beat and are the best your area, We guarantee that our crew has the skills and know-how to construct a top quality wall that will enhance the appearance of your home and will add value to your property. Our crew is very efficient and will use top quality materials that can withstand extreme heat and cold. Plus, you can rely on these materials to be resistant to damage from rain, winds and snow. If you want a well built retaining wall that will last for years, contact us today to make an appointment. We are highly reputable and well experienced and are the best and most reliable in the region in Building Retaining Walls in Arlington, TX.